Presented in these pages are items mostly from my personal collection. Additional photos were acquired through friends who are also members of the Automobile License Plate Collectors Association. The main purpose of this page is to supplement the information found in the official ALPCA archives. I would highly recommend that you visit the ALPCA website at www.alpca.org for additional information about our association. The images being presented are believed to be in approximate chronological order by the year of issuance. 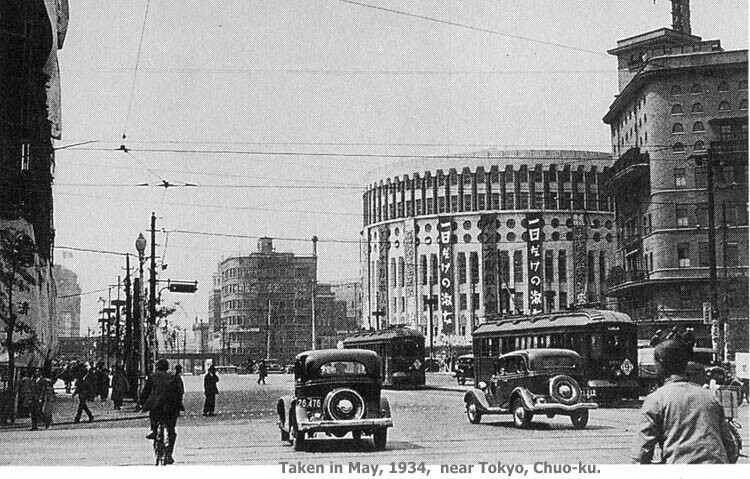 I would love to hear from anyone who has vintage photos of Japan and/or Okinawa related license plates to contribute to this section of my website. You can click on some of the images for a larger view. 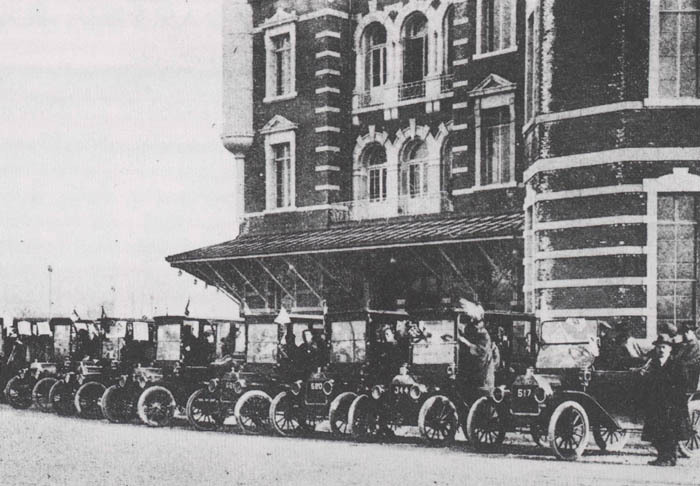 This photo from 1925 shows a line-up of Taxis awaiting fare paying passengers outside the Tokyo train depot. You can see the white on black 3-digit license plates on these vintage vehicles. These plates are made of steel, with embossed kanji character and numbers painted white on black painted background. There are variations in the way the numbers are presented on these plates - one with a comma or a dot before last 3 digits and one without. Possible size difference between front and rear plate. These plates are made of aluminum, with silver (bare aluminum) lettering on black painted background. This type of plate was in use throughout the mid-1930s until the plate design changeover in 1948. Note the variations in the way numbers are presented. Some had a dot before last 3 digits; plate from Chiba had a dash (hyphen) before last 3 digits while an example from the Hyogo prefecture shows a plain 4 digit number. 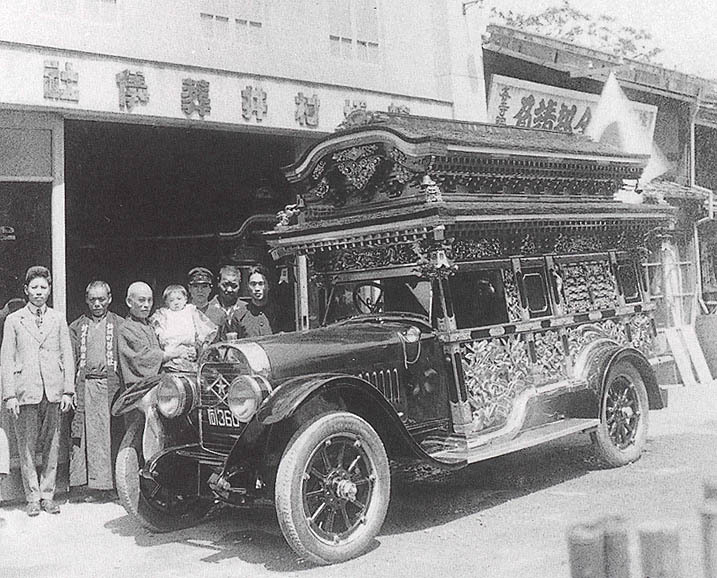 Family members of the funeral parlor in Ishikawa Prefecture pose next to the traditional style hearse. Here is one made of very heavy guage steel, with hand painted white lettering on black painted background. It has the Japanese Navy Insignia to the left, then 57th base written vertically in Japanese Kanji characters, followed by the serial number 503. This plate was believed to have been carried back into the U.S. after the war as a keepsake. This vehicle appears to be sporting one of the home made license plates from 1945. 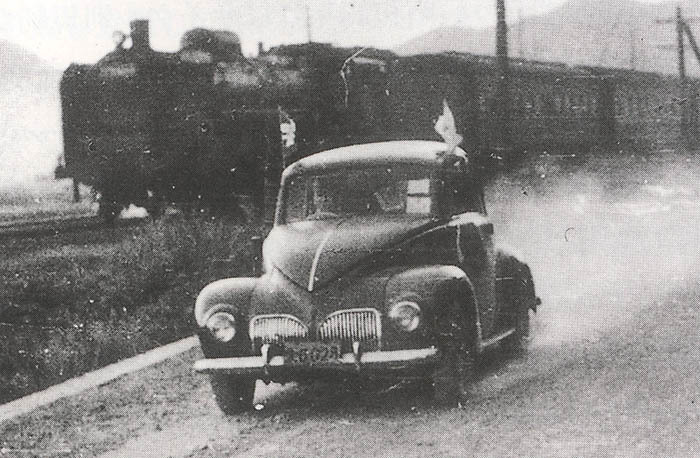 There were metal shortages during WWII, so the license plates of this time frame were made simply by handwriting the plate number on a rectangular wooden board with black India ink. This undated heavy steel plate with black numbers and the legend 'OKINAWA' embossed on a painted white background was believed to have been used on private vehicles belonging to the U.S. Forces personnel stationed in Okinawa between 1945 and 1950. There are several variations of this type known to exist. This type of plate was believed to have been used on private vehicles belonging to the U.S. Forces personnel occupying Japan between 1946 and 1948. If anyone has any information related to the various prefixes and/or suffixes used on this type of plate, please contact me. Made of aluminum with black lettering on white background. Note the old style kanji used for 'Ao'. This plate belongs to a friend of mine. This plate also belongs to my friend. The yellowish lettering on black background is very interesting, as commercial plates of this era were said to have had white lettering on black background, according to official Japanese sources. This one is also from my friend's collection. The plate is made of heavy guage steel, with white lettering on blue background. The rust on the lettering makes it appear yellowish. Kanagawa license plates in the 40,000 serial number range appear to have been reserved for official vehicles. This plate from Gunma prefecture is made of aluminum, with silver (bare aluminum) lettering on painted light blue background. It has one lock tab with prefectural kanji character stamped onto it still intact. This scarce type of license plate is made of steel, with black lettering on green background. A Commercial Vehicle License Plate from Nagasaki-Ken?? Made of aluminum with black background. These appear to have been used on private vehicles belonging to the U.S. Forces personnel. Issued annually from 1949 to 1952 in alternating colors. The #1A-1 plate was acquired through an auction recently. According to the seller, his wife's father who was the Provost Marshal of Yokohama had the matching pair of these plates and apparently he brought them back with him when he returned to the states. The plates have been safeguarded in their family ever since. If anyone knows the meaning behind the prefixes used on these types of plates, please let me know. A new vehicle regulation went into effect on July 1, 1951, calling for the standardization of license plates used in Japan. Prior to the passage of this regulation, license plates of varying sizes, styles and colors were being used throughout Japan. Although the height of these license plates were observed to be between 141 mm and 150 mm, these plates were issued with variable length depending on the kanji prefix/vehicle class/serial number combination used on the plate. The new standard colors were deep green lettering on white background for all passenger vehicles, and black lettering on yellow background for commercial vehicles. License plates for use on light vehicles and motorcycles had its own specifications which differed from the normal passenger issues. It was mandatory for all earlier style license plates to be turned in to the Land Transportation Offices to be exchanged for the 1951 style plates by December 31, 1952. 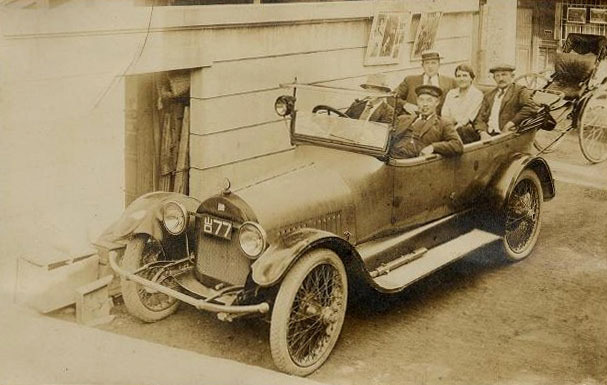 Here are some rare vintage photos of vehicles sporting the license plates of this period. The first photo shows the rear view of a taxi and the license plate from Fukuoka Prefecture. The second photo of a commercial truck license plate was taken at the scene of an automobile accident in the City of Kamakura, Kanagawa Prefecture. These narrow rectangular plates were issued to privately owned vehicles belonging to all foreign forces personnel in Japan. All foreign forces personnel, which consisted of certain United Nations Forces personnel but mostly the U.S. Forces personnel who fell under the 'Status of Forces Agreement (SOFA)', were issued these undated Japanese style license plates which became the standardized issue a year earlier. The only notable distinction being the western alphabet 'A' or 'B' replacing the hyphen (dash) that was being used on plates issued to Japanese motorists at the time. The plates with low numbers (between 1 and 99) were often reserved for high ranking officers, according to one Japanese magazine article. The kanji prefix indicated the prefecture where the vehicle was being registered, with the exception of Tokyo, where the prefix was omitted. If you know of any others with a different Kanji prefix not shown here, please contact me. These are examples of the plates that were being used on the islands of Okinawa between 1952 and 1956, which was under the U. S. administration at the time. Plates of this period were being issued annually in varying designs and colors. The temporary license plate is often used for transporting an unregistered motor vehicle to and from a vehicle inspection station. It is likely that this particular style of temporary plates was introduced in 1951, as these plates used similar or identical number dies found on the normal undated (1951-1955) narrow rectangular base plates, and are believed to be the predecessors to the temporary license plates currently in use today. A new vehicle regulation was introduced on March 28, 1955 to change the specifications of license plates. It was mandatory that all 1951-1955 style (narrow rectangular type) license plates were to be exchanged for the new 1955 style plates by September 30, 1955. All regular passenger plates became standardized at 330 mm x 165 mm, which is the size still in use today. These plates used leading zeros instead of the small dot(s) which are being used on current Japanese plates with a serial number less than 1000. Also the dies used for the Land Transportation Office (LTO) designators and the hiragana prefix were larger than those in use today. Commercial passenger vehicle plates of this era had black lettering on orange background. These plates were mainly used on taxis. If you know of any others with a different LTO Kanji designator not shown here, please contact me. New specifications for the license plates went into effect on August 16, 1962. 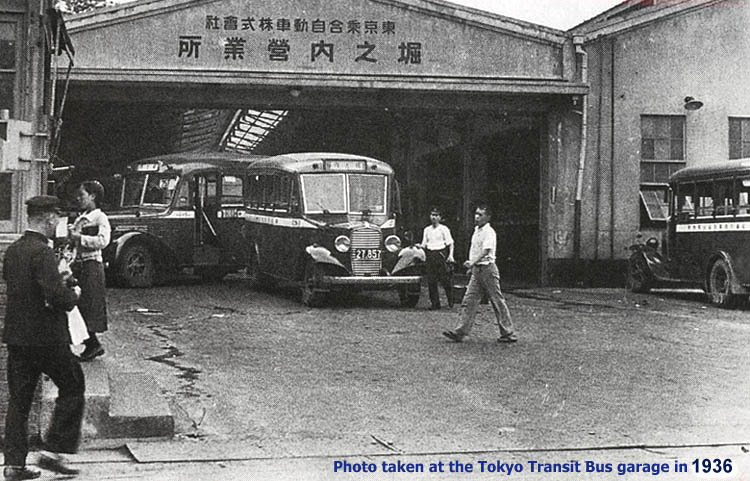 The dimensions of the medium size license plates remained the same at 330 mm x 165 mm, while the LTO designator kanji and vehicle class code (single digit) as well as hiragana prefix were made slightly smaller than the dies used for the 1955 base. Also the use of leading dot(s) for numbers less than 1000 and hyphen between the two sets of numbers were introduced at this time. During this period, large size (440 mm x 220 mm) license plates for use on large vehicles such as trucks and busses, as well as small size (230 mm x 125 mm) license plates for use on light vehicles and motorcycles were also standardized. This interesting U.S. Forces in Japan motorcycle license plate, with an unusual 'H' prefix, surfaced recently. According to the previous owner of this item, it was from his brother's Honda motorcycle from back around 1968. His brother, Raymond J. Czar, was stationed at the U.S. Naval Base in Yokosuka at the time. There were at least 4 different types of U.S. Forces in Okinawa license plates in use between 1962-1972. The first type was the dated 1962 issue. The undated type with a green decal was issued for 1963. Although this new undated base was introduced for 1963, I have also seen examples of the '63 decal being used on the previous 1962 dated base. Then there was an undated type with a black border, in the standard U.S. size of 12 x 6 inches. This style was in use from 1964 to 1965 (validated with a '65 decal). The fourth type with 2 alpha prefix was being used from 1966 until the administration of the islands of Okinawa was transitioned over to Japan in 1972. The 1966-1972 style plates were believed to have been manufactured in Texas. The standard Japanese style plates were issued to the U.S. Forces personnel stationed in Okinawa, following the reversion of Okinawa on May 15, 1972. Specifications for the Temporary License Plate as well as Delivery License Plate were modified on January 1, 1970. The vehicle class codes for all vehicle types, excluding light vehicles and motorcycles, were doubled up ('3' became '33', '5' changed to '55', etc.) on nationwide basis beginning on March 1, 1970. New computerized vehicle registration system became operational at this time. The rear illuminated license plates were introduced in Hokkaido in November of 1970. The original purpose of these rear illuminated plates were to improve the visibility of numerals and characters on license plates while in blizzard and/or heavy snow conditions. The incandescent bulbs originally used with the rear illuminated license plate and a sealed frame assembly warmed the plate, thus helping to melt the snow that may otherwise stick to the exposed surface of license plates. Today, this extra cost optional plates are being used for other purposes, mainly to enhance the overall appearance of a vehicle. Any LTOs still using the single character designator kanji were converted to fully spelled out LTO designator kanji starting on January 1, 1988. All other specifications remained the same. Introduction of 3-digit vehicle class codes in 26 selected LTOs on May 19, 1998. Nationwide conversion to 3-digit vehicle class codes began on May 14, 1999. The 319 vehicle code on the Izumi license plate indicates that the low number plate was allocated by a lottery system.